We drove several hours from PA to VA to see little Baz - a lemon beagle. His heart was huge, but after being abused, little Baz was afraid of the world he lived in. Shortly after arriving home, Baz ran away for 5 days after being frightened from the swaying clothes line. Fortunately, a near by neighbor came home and walked her dog who was pulling her to see something. The something was Baz tangled in some fencing with the retractable leash he pulled out of my hand. As we went to retrieve Baz, he was standing on her sofa wagging his tail! He managed to escape one more time after the patio furniture scared him. Fortuantely, this was only overnight and the next morning I awoke to walk the walk we did daily. Lo and behold there was little Baz! Although frustrated, the tears welled in my eyes at the sight of him. After accepting Baz for Baz, we eventually began to bond. We nurtured Baz to not be so afraid of the world and to stop hiding on the landing when visitors came to see us. Baz only needed love for short spurts and he was good, but always the tail wagged and he always greeted us. Only after adopting a puppy did we truly realize how sheltered Baz was because of his abuse. He never played with the toys we purchased for him, every little noise scared him, all the belly rubs he missed out on and the list continues. It gives my husband and I greater appreciation for those who foster beagles -or any dog for that matter- until their forever home is found. We also love our puppy a little more because Baz would have wanted that. 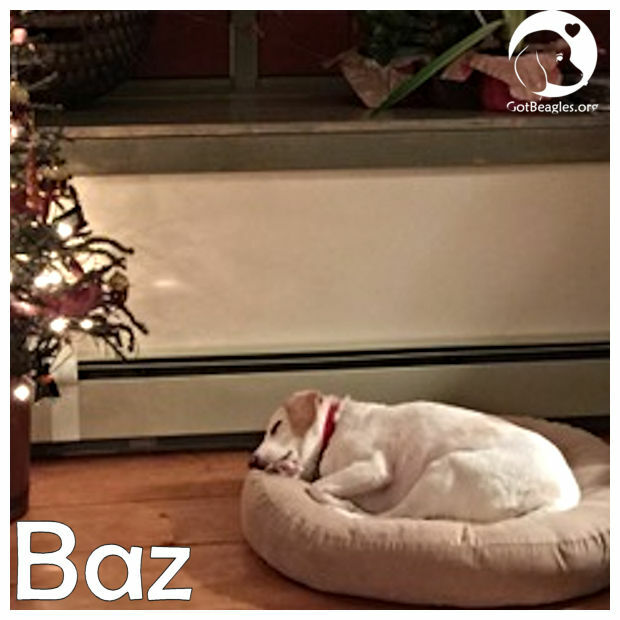 We are grateful for everyone at Midwest BREW who had faith in us to adopt Baz and give him his forever home. We all brought each other a lot of love and joy over the 12 years we were together.